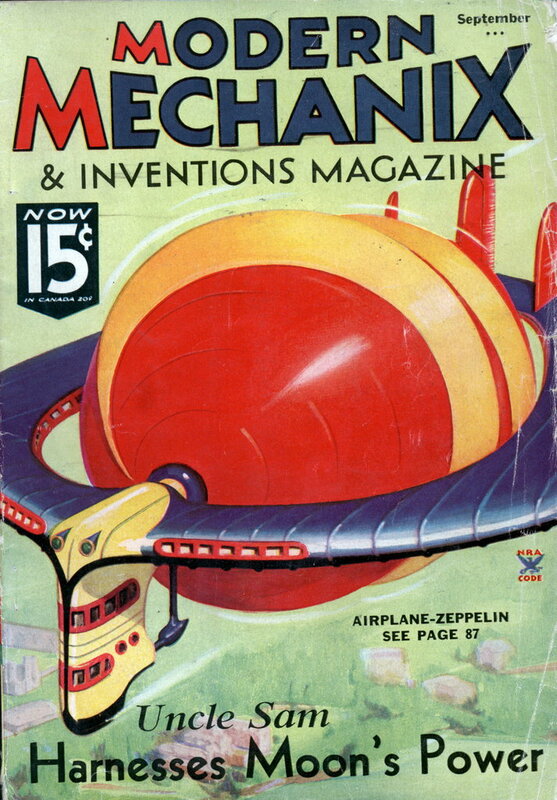 CAPABLE of rifling its way through the air at a speed of 300 miles an hour, or hovering motionless above a chosen spot, an airplane-Zeppelin soon to be put through exhaustive tests at Rapid City, S. D., is expected by its inventors to become the transport plane of the future. Startling though the design of the plane may be in its radical departure from accepted plans, combining as it does features of both the airplane and the Zeppelin, it represents years of work on the part of Rev. C. H. Loocke, known as the “Flying Parson,” and Lorin Hansen, a young printer. 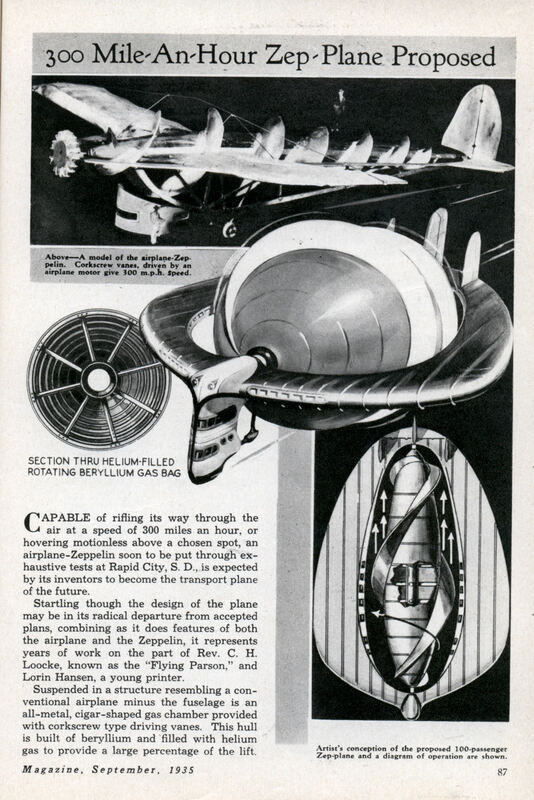 Suspended in a structure resembling a conventional airplane minus the fuselage is an all-metal, cigar-shaped gas chamber provided with corkscrew type driving vanes. This hull is built of beryllium and filled with helium gas to provide a large percentage of the lift. Beryllium metal is, due to its stiffness, light weight, and dimensional stability over a wide temperature range, used in the defense and aerospace industries as light-weight structural materials in high-speed aircraft, missiles, space vehicles and communication satellites. For example, many high-quality liquid fueled rockets use nozzles of pure Be, an example being the Saturn V.
seems a bit pricey for building a plane out of this brittle metal whose wind resistance will never allow it to go faster than probably 150-200 knots. How could anyone look at this without suggesting dual counter rotating screws? That, and the huge screws would have to be balanced perfectly, and would have huge surface area friction.